Founded by veterans of Cesar’s Roman Legion in 40-30 BC, the etymology of its name is thought to come from Arausio, a place linked to the river below. In the Middle Ages, under Charlemagne, Orange became a county, then from the XIIth to XVIIIth centuries, a principality. It is in 1544 that Prince William Ist founded the Orange-Nassau household, a Dutch household. In 1713, the principality is terminated and attached to France under the Treaty of Utrecht. The Nassau family, which today rules the Netherlands, to this day retain the title of “Prince of Orange”. 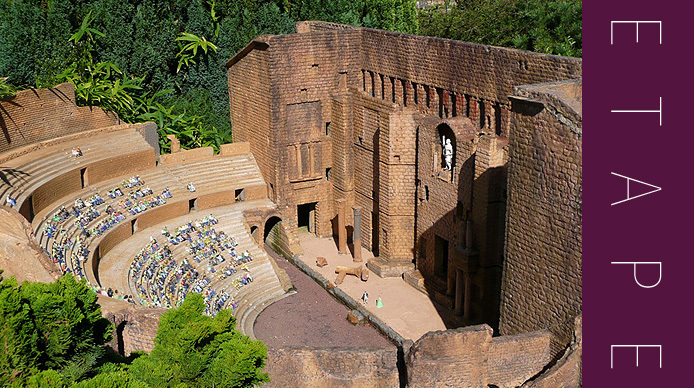 The Roman origins of the city of Orange are especially visible in two edifices that were erected at the beginning of the Christian era: the Antique theatre and the Arc of Triumph. The Arc of Triumph. An honorary passageway, it marked the limit between the world of the dead and that of the antique city. Dedicated to the veterans of the IInd gallic legion and to Tiberius, it symbolises the triumph of Rome and its supremacy. An exceptional example of Roman art in the Provence. Cathedral of Our Lady of Nazareth and All Saint. It was consecrated in 1208 in the presence of Prince William of Baux. The museum of Art and History. Opposite the Antique Theatre, in a private residence from the XVIIth century, there is a section dedicated to the history of Orange, from prehistory to present days. The Place aux Herbes. Located just a few steps from the Antique theatre, a small shaded square with a large plane tree, ideal to quietly enjoy the warmer hours of the day. Augustus’ Cave. A restaurant dug up in the enclosure of the Antique theatre that was inaugurated by Roberto Alagna and Georges Clooney. With such a patronage, success is a given and the Cave is always full. During the Chorégies, it is the meeting place of all the celebrities. Throughout the year, the owner Fadil Nergui ensures the atmosphere reigns high and organises themed evenings, jazz nights and a cuisine that is perfectly in tune. 35 Montée des Princes d’Orange. Tel. : +33 4 90 60 22 54. Pâtisserie Didier Carpentier. The Augustines and the Sablé du Théâtre, chocolates with the effigy of Emperor Augustus. 9 rue Pourtoules.